Fully automate your product inspection and quality assurance processes with machine vision systems from CIMTEC. We offer vision inspection systems that combine industrial grade quality and cutting edge technology with absolute precision and speed to assure the detection of even the minutest defects. Cognex In-Sight vision systems from CIMTEC are easily integrated into any factory automation system or automation control system. These provide your team with the capability to power and control a range of external lighting, in addition to inspecting, identifying and guiding parts through a facility. 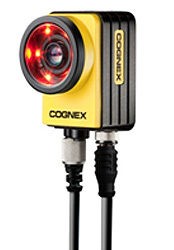 Available in a range of models to meet any budget and performance requirement, Cognex machine vision systems can be used for general color, line scan, high-resolution and identification applications in a variety of industries. With machine vision systems from CIMTEC, you can optimize quality, drive down costs and enable or enhance your automation processes. In addition, we can help with any other automation questions you may have as we have a wide array of knowledge in industrial automation services and solutions. Contact us for more information today.